Free Shipping to contiguous USA destinations and Canada destinations! Now available at Special Price Shown for a limited time only. OneGO™ - Our electronic control system featuring intelligent software LED interface and multiple function analysis. OneGO soft touch buttons allows you to run a selection of three different cycles, all in one easy touch! SmartSelf™ diagnostics - have all necessary advanced service diagnostics information at your fingertips! Model 737E (737E model is an Electronics Enhanced F-18DP Model) is fully equipped with a built-in booster for high temperature rinse water, automatic peristaltic pumps for both liquid detergent and rinse-additive, and an automatic drain pump that has exclusive "wash down" feature at the end of the work day for a self-cleaning operation. Inner washing chamber with coved corners and one-piece stamped wash tank provides user with the most sanitary environment. 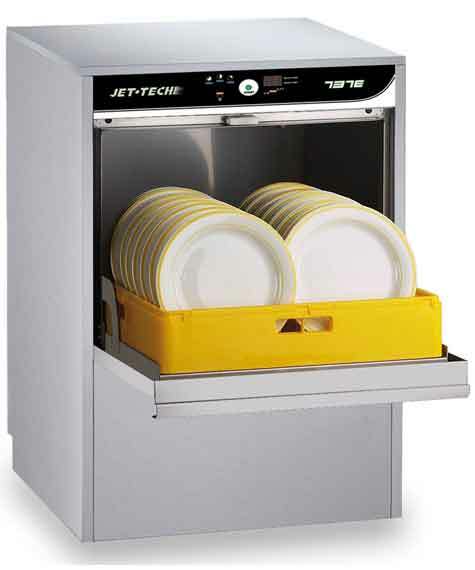 Our recessed wash tank makes the 737E ideally suited for marine applications. Free Shipping to the contiguous USA and Canadian Provinces with commercial address destination.